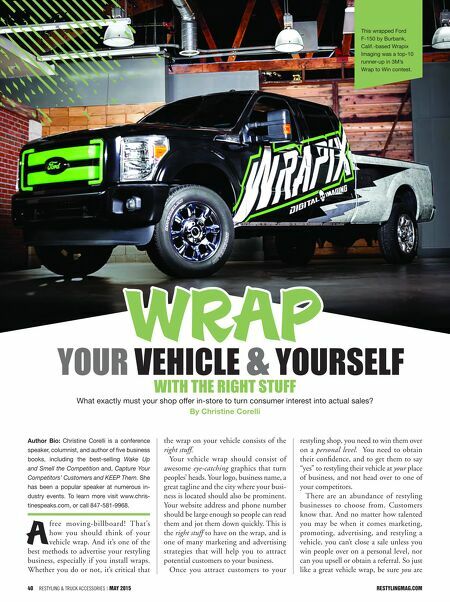 40 Restyling & tRuck AccessoRies | May 2015 restylingmag.com Author Bio: Christine Corelli is a conference speaker, columnist, and author of five business books, including the best-selling Wake Up and Smell the Competition and, Capture Your Competitors' Customers and KEEP Them. She has been a popular speaker at numerous in- dustry events. To learn more visit www.chris- tinespeaks.com, or call 847-581-9968. A free moving-billboard! That's how you should think of your vehicle wrap. And it's one of the best methods to advertise your restyling business, especially if you install wraps. Whether you do or not, it's critical that the wrap on your vehicle consists of the right stuff. Your vehicle wrap should consist of awesome eye-catching graphics that turn peoples' heads. Your logo, business name, a great tagline and the city where your busi- ness is located should also be prominent. Your website address and phone number should be large enough so people can read them and jot them down quickly. This is the right stuff to have on the wrap, and is one of many marketing and advertising strategies that will help you to attract potential customers to your business. Once you attract customers to your restyling shop, you need to win them over on a personal level. You need to obtain their confidence, and to get them to say "yes" to restyling their vehicle at your place of business, and not head over to one of your competitors. There are an abundance of restyling businesses to choose from. Customers know that. And no matter how talented you may be when it comes marketing, promoting, advertising, and restyling a vehicle, you can't close a sale unless you win people over on a personal level, nor can you upsell or obtain a referral. So just like a great vehicle wrap, be sure you are What exactly must your shop offer in-store to turn consumer interest into actual sales? with the Right Stuff YouR Vehicle & YouRSelf By Christine Corelli WrAp This wrapped Ford F-150 by Burbank, Calif.-based Wrapix Imaging was a top-10 runner-up in 3M's Wrap to Win contest.